Normally when you initialize a new Google map you set the coordinates for the center of the map and manually specifies the initial zoom level. Sometimes, however, there’s a need to dynamically calculate the center point and zoom level for certain content to fit into the viewport. Let’s say that you have a number of markers on a map and you want the map to be displayed so that they all fit inside the viewport. You could of course experiment with center point and zoom levels to get it right. But what if the markers are put there dynamically so you don’t know beforehand where they’ll show up? That’s where this trick will come in handy. First you have to calculate the bounding box. That is, the coordinate for the south-west and north-east corners. In this case the coordinates for the marker that’s most south and the marker that’s most west provides the coordinates for the south-west corner. And vice versa for the north-east corner. Now that you know the coordinates you just have to create a GLatLngBounds object, define it’s coordinates and serve it to GMap2.setCenter(). GLatLngBounds takes two optional arguments. A GLatLng for the south-west corner and a GLatLng for the north-east corner. 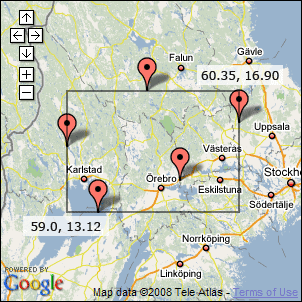 GMap2.getBoundsZoomLevel() calculates the appropriate zoom level to fit the bounding box in the available viewport. It also adds some extra padding around the box. I was shown this technique by my good friend Fredrik Jonsson, who writes about programming on freddes.se. Wait a minute – where did you get the values for sw and ne from? Wasn’t the point of the article to show how to create a box around a _dynamic_ set of points? Alan: Yes that’s right, but for the sake of simplicity in the example, I have explicitly defined the corners of the bounding box. In a real-world implementation I would naturally calculate sw and ne from the data that I’m showing. Can you explain a good way to determine the sw and ne from the data? I can imagine doing a minimum and maximum loop thru all the data, but it seems like there should be an easier way to get via an api call of some sort. Alan: There are several ways to do it servers-side depending on which language you use. In a solution I’m currently working on where we use C# and SQL Server 2008 I use the SqlGeometry object to handle GEO data. I get the data that I want to display on the map as a SqlGeometry object and on that object I then call the method STEnvelope() which returns a Bounding Box for the GEO data. In the Google Maps API there’s the GLatLngBounds class which is a representation of a BoundingBox. Some overlays such as GPolyLine and GPolygon has a getBounds() method that returns a GLatLngBounds. In the case of markers I don’t know of any easy way to do it. I guess one have to do as you suggest and loop through them all to extract min and max values. Actually you don’t have to Define the two corners of the bounding box because it can assign later by using extend. didn’t work properly and will returns an incorrect zoom level. until now i can’t figure out this problem. Aiska: Cool! I never thought of that, but naturally that’s one way to do it. Thanks! I have never encountered the error you’re talking about myself. Could be a bug in the API? Gabriel Svennerberg: yeah that’s right maybe this is bugs in API. I found new method how to set zoom level of a google map base on markers. Maybe that’s the reason it doesn’t work properly? I haven’t looked at your new method yet. If you’re getting the lat and long from a collection of Ruby objects. OK that didn’t post directly… I’ll reformat it and post again later. We have an image with two points in the middle and the bound area in pixels only and two reference points in the image with their pixel coordinates. We can get a zoom/scale for the image based on the above data. We also know the latlng for the above two reference points. How do I set the box north-east and south-west corners so that I can place it on the map. I have a inquiry for the webmaster/admin here at http://www.svennerberg.com. Can I use some of the information from this post above if I give a link back to your website? I have used ur code. but i m not able to see the any bounding box…. Can u please help me on this….